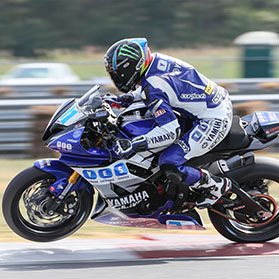 Graves Motorsports Yamaha R1 Top Velocity Stacks for the 2009-2014 models. This "Upper" or "Top" velocity stack is sold seperately from the lower billet machined piece shown in picture ( Lower Part # ABY-09R1-REVB). See below for full details and restrictions on these parts when used with stock pieces. The upper stacks must be used with a YEC ECU or Flash Tune and correct setting will be supplied to customer upon purchase. Developed by Graves for your Cross Plane Crank Yamaha R1. This stack kit improves power throughout the entire RPM range. The staggered tops allow the cylinders to share the available volume of air in the R1’s air-box evenly at low and mid range RPMs. These stacks were specifically developed on the Graves Yamaha Superbike give our riders the drivability needed to win races. Available now for your 2009-2014 Yamaha R1. NOTE: Both "Upper" and "Lower" R1 Velocity Stacks are designed to work togehter. The items are sold seperately as you can use our performance designed lowers with the stock uppers (uppers cannot be used with the stock lower stacks).